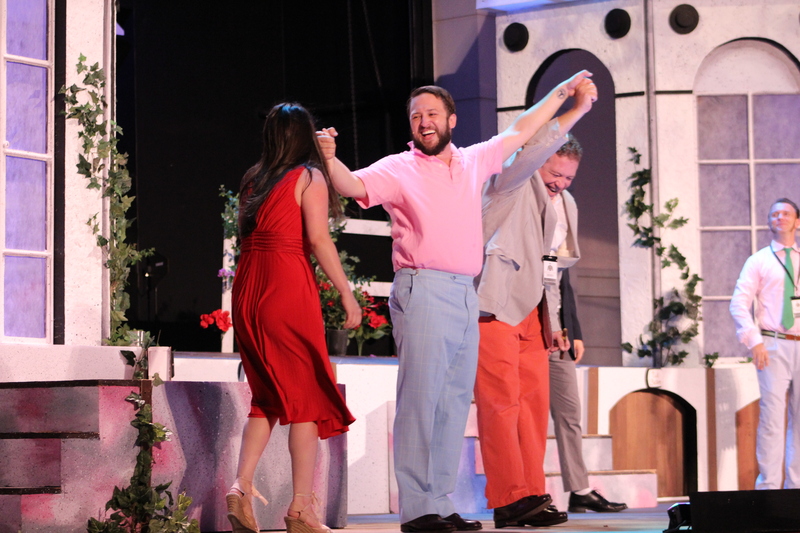 If you’re in search of a way to enjoy the humidity-free evenings we’ve been having this summer, look no further than Shakespeare by the Sea, the annual production of The Palm Beach Shakespeare Festival at the Seabreeze Amphitheatre in Carlin Park. The 26-year-old Jupiter tradition is “off to the races,” staging The Taming of the Shrew with a Kentucky Derby twist. Remaining performances are July 14 – 17 at 8:00 p.m. Gates open at 6:30 p.m. – plan to arrive early to get a good seat! In the spirit of the Summer of FREEdom, admission is FREE! Churchill Downs right here in Jupiter! Bring your beach blankets and folding chairs, wine and beer, and a smorgasbord fit for a king. Attendees are professional picnickers with some serious gear. P and I learned this the hard way last year when we arrived with a lowly bottle of pinot grigio and two cheap wine glasses only to be surrounded by audience members with miniature folding tables, table linens, cheese boards, real silverware, and rolling coolers. It is important to be fancy at Shakespeare by the Sea. Prosecco and newsboy caps optional. This year we upped our game and invited friends and family who really know how to tail-gate, Shakespeare-style. (The boys even dressed for the Kentucky Derby theme!) Thank you to JUP Mama and Daddy, #Johnnifer (the newlyweds!! ), D and L, and R and J. We did not go hungry this year either. I whipped up The Pioneer Woman’s Watermelon Salsa (also know as her Watermelon Pico de Gallo) and you can find the fun how-to video here or the step-by-step recipe here. Let me tell ya – I don’t even like watermelon and I thought it was delicious! I won’t give the plot away, but The Taming of the Shrew is one of Shakespeare’s most popular comedy plays. It was famously adapted for the movie screen in 1967 starring Elizabeth Taylor as feisty Katherina, the “shrew,” and Richard Burton as Petruchio, the suitor who tries to woo her for her father’s wealth. Cole Porter updated the story in his beloved musical Kiss Me Kate and the 90’s teen movie 10 Things I Hate About You is loosely based on the play. It wouldn’t be called The Taming of the Shrew if it didn’t include some sparring between the main characters played by Kelly Lee Hussey (Katherina) and Darryl Willis (Petruchio). The performances are donation based so please make sure to bring some extra cash for the troubadour, who will gladly recite you a sonnet at the steep cost of five dollars. P and J even got into the Edwardian spirit and recited some sonnets of their own. To JUP or not to JUP – that is the question. Great post! It was such a fun outing with everyone! Even though I didn’t make my Blog debut… maybe next time!